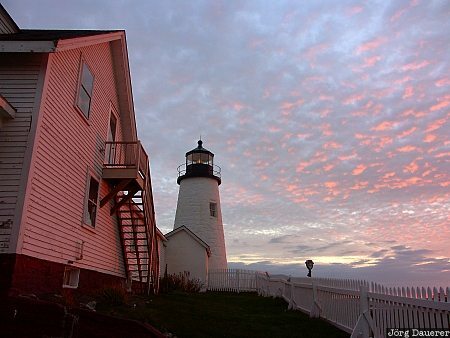 Pemaquid Point Lighthouse in front of a colorful sunrise. Pemaquid Point Lighthouse is at the tip of the Pemaquid Peninsula near Bristol in central Maine at the east coast of the United States. This photo was taken in the morning of a cloudy day in November of 2004. This photo is part of the exhibition Colorful Sunrise (October 2013). This photo was the image of the month in January of 2015. This photo was taken with a digital camera.